Smaller hand held fire modalities are the safest most controlled forms of fire dancing. Fire Fans, torches, palm torches & Umbrellas are used for a variety of techniques and tricks with fire, or are simply used as an additional spark to a dancers performance. These smaller hand – held props are good for indoor events or smaller shows. Smaller implements are a great way to ‘get to know’ fire, if you are lighting up for the first time or just wanting to add some fire to a show or event. Fire Fans come in all different shapes and sizes, depending on how large you want the flames to be, or how much manipulation you prefer will decide on the shape and size of your fans. Fans are wonderful for choreography, as they allow the dancer more freedom in the body, while being able to move the body fluidly. Fire fans are also great when learning to dance with a partner, as you can easily decrease the space between you and your partner while wielding a fan. 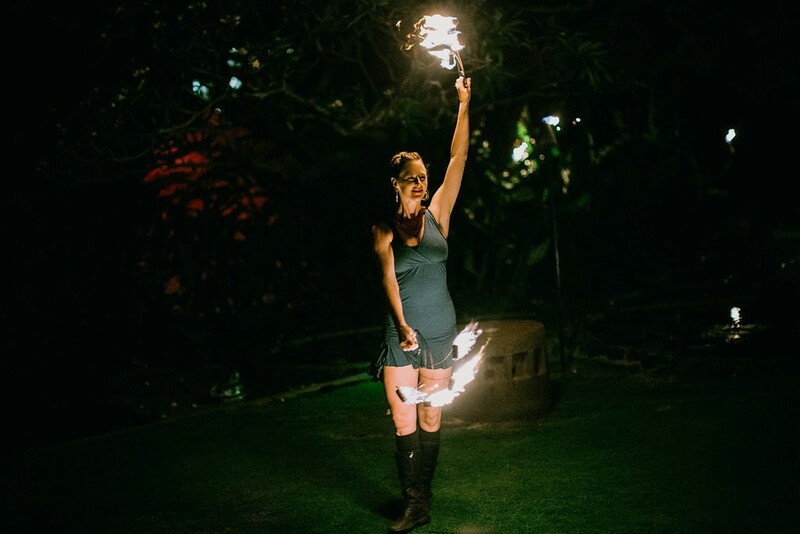 Fire torches are beautiful, either used as palm torches, hand-held or for fire eating/breathing Many belly dancers and troupes will use torches for more lyrical pieces or choreography, as they can be manipulated smoothly with the roll of a wrist. Certain types of fire torches have been made into swinging torches and can be utilized like poi. These modalities, like all modalities are best to learn by a practiced professional.